The NTWRK Agency has been representing a diverse streetwear clientele as a standalone company after being rebranded nearly two years ago, on 4/11/11. 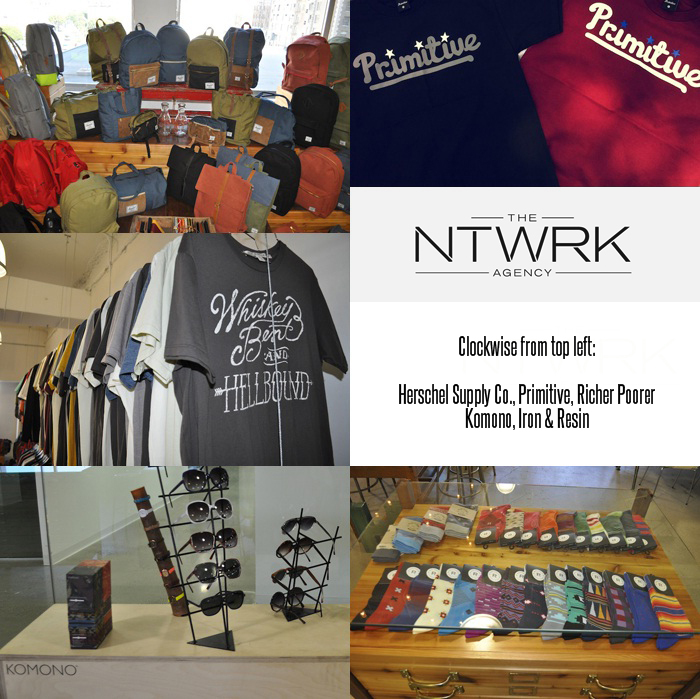 Currently on the client roster for The NTWRK Agency are: Herschel Supply Co., Richer Poorer, Iron & Resin, Primitive, Brothers Marshall, and Komono. "Our goal is to do the best we can for our brands and grow them to get them into the best retailers in the US," said The NTWRK Agency President, Kellen Roland at the LA showroom. "We want to make sure that each season our brands are in the best stores and we're out there building collaborations and special projects." The NTWRK Agency, which was originally formed as the Agenda Showroom, has experienced tremendous growth in the past two years since the rebranding. And, after hiring six new staff members in the past six months, the team now boasts a healthy staff of eleven working from offices in LA and NYC. 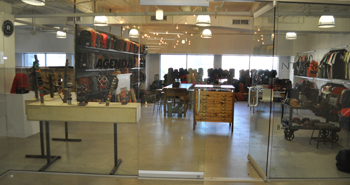 The agency's Los Angeles office is located Downtown - in the heart of the fashion district - and is currently being shared with the staff at Agenda. The new space on the east coast for The NTWRK, in New York City, on W. 39th St., is also located in prime territory for attracting buyers to the showroom. 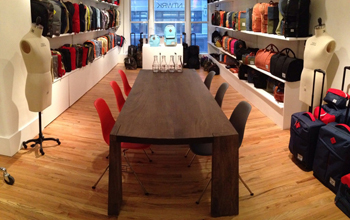 "Our New York showroom, in the heart of the garment district, has made things easier for our east coast reps in providing a space," explained Kellen. "It truly reflects on the growth of the agency." On the day the New York showroom opened, buyers from Bloomingdales and a handful of other companies were present - a result of having reps in NY for several years. For the New York showroom, The NTWRK went with a gallery approach, a bit different from the LA showroom, which has a rustic feel. So, what's new and coming up for The NTWRK? They've recently added Komono as a client and have plenty of exciting collaborations in the works, including a shoe/bookbag release from Herschel and New Balance and a project involving Iron & Resin with Dickies. 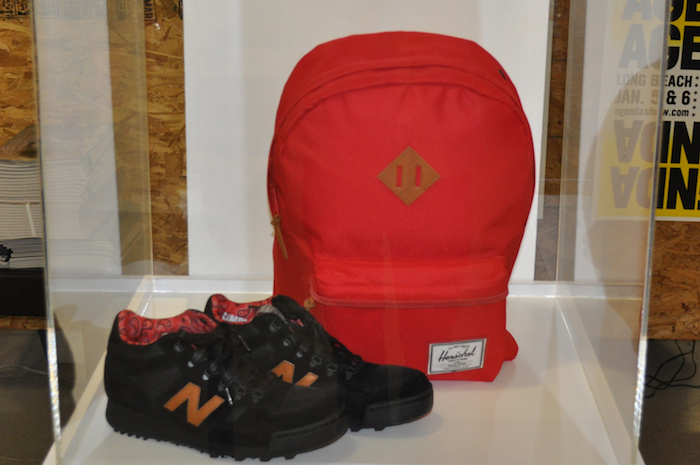 Also, the Spring '13 product lines are hitting stores now and the agency is really looking forward to the back-to-school season, a busy time for all of The NTWRK's brands. We spoke with NTWRK Agency President, Kellen Roland, about his client roster, the growth of the company, the agency's relationship with Aaron Levant and Agenda, plus more. What exactly does The NTWRK Agency do for its current roster of six clients? As an agency, we feel we are a reflection of our clients, and we look to offer the best service for our brands; although the main objective is sales. We treat our clients as if we're in-house employees and we strive to be consistent while looking to elevate our brands. Our goal is to do the best we can for our brands and grow them and get them into the best retailers in the US and make sure that each season our brands are in the best stores and we're out there building collaborations and special projects. How important is your relationship with Agenda for your clients in either scouting talent of for promotion/marketing/sales for those brands? We draw a pretty strong line in the sand with Agenda. Our relationship with Aaron is very important, he's at the top of his field in pretty much everything that he does and anytime you have a chance to sit down with Aaron and talk to him, you learn so much. We definitely learn a lot from just having a connection to everyone at Agenda, but we run the businesses as two separate entities. At the end of the day, we are considered a customer of the trade show and all of The NTWRK brands exhibit at every Agenda. We exhibit at Agenda because every brand in the showroom has a specific reason to be at Agenda because Agenda not only caters to action sports and to streetwear, but also lifestyle and accessories - men's and women's. Going to Agenda for the NTWRK is key to our business because it offers us a key opportunity to really engage with our customers, spend time with our colleagues and contemporaries to cultivate new business and strengthen our relationships with the retail partners that are out there on the front lines selling our brands. Spending time with our brand owners and engaging into the industry, and seeing it all happen - like a lot of creative and great business ideas coming from the floor - a lot of amazing things that happen in this industry happen at Agenda. When you put all those people in the same room, good things tend to happen. You faced a lot more challenges as an emerging company. Can you reflect on the decision to break off and start off as a new entity from Agenda? How exactly did that go down? As the tradeshow grew and as the showroom grew, we always knew in the back of our minds that at some point we would fully separate the businesses. It was a plan of ours throughout the course of doing the showroom and as it was growing, we always wanted to break it off to give it its own identity. Then, on 4/11/11 when we did that, it was the perfect timing when we had hit that critical mass. Our brands were established enough, our staff was robust and our business was becoming so big that we needed to step out on our own and become part of our niche in the industry. You've added six new people to The NTWRK team in the last six months - can you go through a brief roll call? That's right. We've got some new Account Reps. 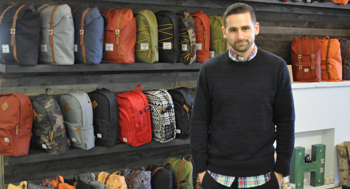 Recently, we've added Ian Perez who does the Southeast for Herschel Supply Company. He came from Rhythm, and before that he was one of the main Managers at the Closet. We added Ryan Romero, and he does the Northwest and the Midwest for Herschel. He came from Spy and Vestal. Then we hired Justin Maruco, and he came from Stacks and before that he was working at Stereo and before that he was at Karmaloop. He's doing Primitive for us. We just brought on Emmeline Ros, and she is our Operations Manager and she came from Ted Baker where she was a Senior Allocator there and an Office Manager and before that she was an Office Administrator at Nordstrom's. Then we brought in Simon Aaronson, our Sales Manager, who came from The Kayo Corp. and before that spent a majority of his professional career with Akademiks. We also added Bree Twohey on our east coast team as a Showroom Assistant. That makes six new hires all on board within the past six months. We also have Taylor Fisher for Herschel on the west coast, Caleb King who handles Iron & Resin, Dana Stewart for Richer Poorer, myself here in LA. Then there's Joanne Portal, who works on our east coast office covering the Northeast for Herschel. 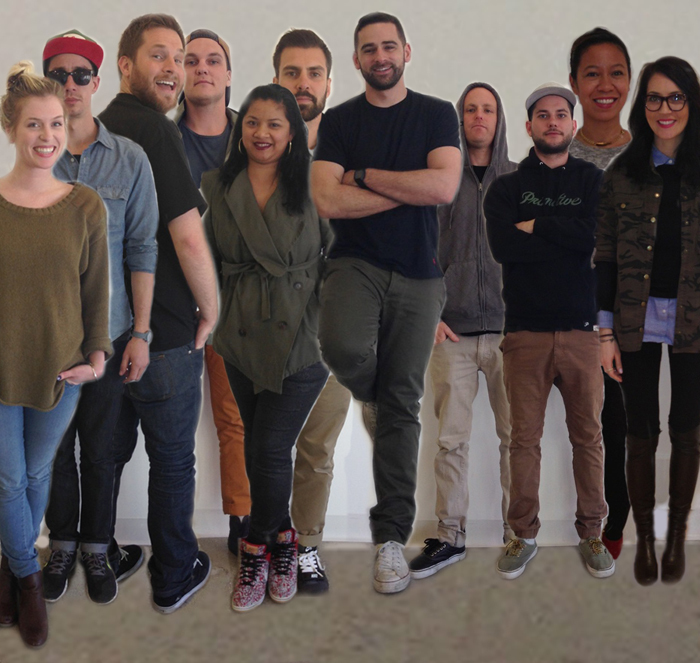 So, there are two people who work on the east coast and nine of us in the West Coast office. 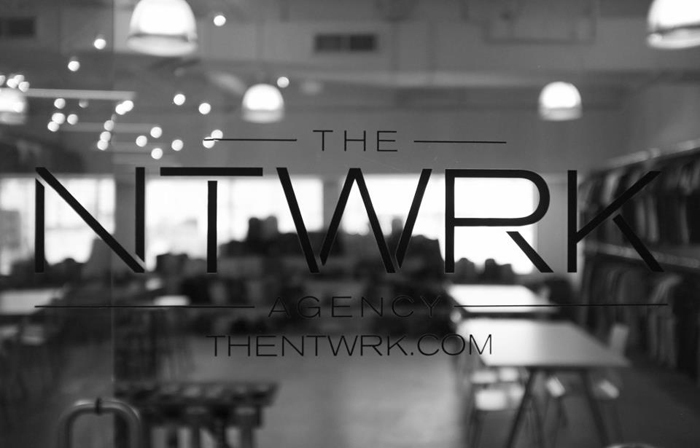 Which agencies, companies or brands have you looked at to try and model The NTWRK Agency after? There are a lot of good agencies out there that do a good job. Looking outside the industry, I really like what companies like William Morris/Endeavor and CAA do. However, they are more well known in the literary and entertainment industries. We will look to grow the NTWRK to have that kind of reach in the future. Do you see any direct competition for The NTWRK Agency's brands in the industry? I don't recognize direct competition, but there are obviously a lot of great brands out there. Our brands are special in that each company has a unique take on their segment of the market. The NTWRK Agency is unique in that our clients and the brands all co-exist well, meaning we are able to target multiple markets - which is how we like it. What are some of your favorite brands as a consumer that maybe the Malakye audience wouldn't necessarily be aware of? Well, I'm a huge fan of Apple, but obviously they are well-known. I'm also a huge fan of this brand called Muji; they are a retailer in Japan that makes everything from pens & pencils to stationary & clothing. I'm also a really big fan of COMME des GARÇONS, Wings + Horns, and Rag & Bone. Obviously, I'm a huge fan of all the brands in the NTWRK and I think they are all the best at what they do as well. Just one more thing everyone should know: you should wash your hands before you go to the bathroom and wash your hands after you go to the bathroom. Just think about it. All images were taken at The NTWRK Agency's DWTN Los Angeles office and showroom. To see more photos from The NTWRK Agency, check out the company's Industry Exposure feature on Malakye.com, here.